Have questions about tickets, refunds, camping, parking or anything else? Check out these frequently asked questions to get all of your answers! Tickets are available at the Winnipeg Folk Festival office, 203-211 Bannatyne Avenue, online at frontgatetickets.ca or can be ordered by phone toll-free through Front Gate Tickets: 1-888-512-SHOW (7469). Four tickets per person and one RV Ticket, if you need one. When is the Early Bird deadline this year? Why do RVs need to purchase a separate ticket for the Festival Campground? We want to ensure that everyone who comes to our campgrounds with an RV has a place to park it. The $25.00 ticket is valid only with a Festival or Quiet Campground ticket and only one RV Ticket is required per RV (not per person). Why does my ticket cost what it does? What about funding and sponsors? The Winnipeg Folk Festival typically receives less than 10% of revenues from government funding. This means over 90% of the revenues needed each year come from earned revenue – ticket sales and sponsorship support. Why does the Festival Campground cost more than the Quiet Campground? It takes significantly more infrastructure and resources to create the Festival Campground. The price of the Festival Campground reflects the additional services and infrastructure we’ve invested in to improve and increase lighting, electricity, first aid, animation projects and performances. The Festival Campground also requires more security to ensure the safety and well-being of its community. Is a single day ticket valid for any day? No. Day tickets are valid only for the day you specify at time of purchase and they cannot be exchanged for a different day. Do children get in free? Yes! Children 12 and under are free. Do you offer a seniors’ discount? Yes, to those 65 years of age or greater. I requested my tickets be mailed to me and I didn’t get them. If you didn’t receive your tickets, please contact Front Gate Tickets Customer Service at 1-888-512-SHOW (7469). Help! I lost my tickets! If you have lost your tickets, please contact Front Gate Tickets Customer Service at 1-888-512-SHOW (7469). Do children need a camping ticket? Children 12 and under get in for free and don’t need a camping ticket. Youth 13-17 need a youth camping ticket. Please keep in mind that anyone under 18 needs to camp with an adult. How do I purchase a ticket with camping? Quiet Campground tickets and Festival Campground tickets are bundled with the 4-day ticket into one single ticket – if you want to camp, you need to purchase a 4-day ticket that includes camping. I've purchased a 4-day ticket without camping, can I add camping? Can I camp without buying a 4-day ticket? Sorry, camping is only sold bundled with a 4-day ticket. Can I visit the campground with a 4-day ticket? Sorry, only people who are camping can enter the campgrounds. Your wristband will grant you entrance only to the campground in which you are camping; for example, you can’t visit your friends in the Festival Campground if you are camping in the Quiet Campground. Quiet Campground? What’s that all about? Quiet camping is a bit further away from the festival site and offers a great experience with plenty of shade, shelters with running water and flush toilets. It’s a quiet environment to ensure a good night’s sleep. There is a free shuttle to the festival site every 30 minutes. Thousands of festival-goers camp there every year – and they love it! Quiet Campground Box Office will open at 8:00 AM on Wednesday morning. Can I camp with an RV? Yes, we offer unserviced RV camping in a specific area in both of our campgrounds. Due to the popularity of the RV camping sections, you must purchase an RV Ticket in advance to ensure you will get a spot when you arrive. Why doesn’t the Festival let more people into the Festival Campground? The capacity of the Festival Campground is established in consultation with the RCMP and Birds Hill Provincial Park. It is capped to ensure a positive and safe experience for everyone. I’m a volunteer – where do I get more info about camping? What amenities are available in the Festival Campground? 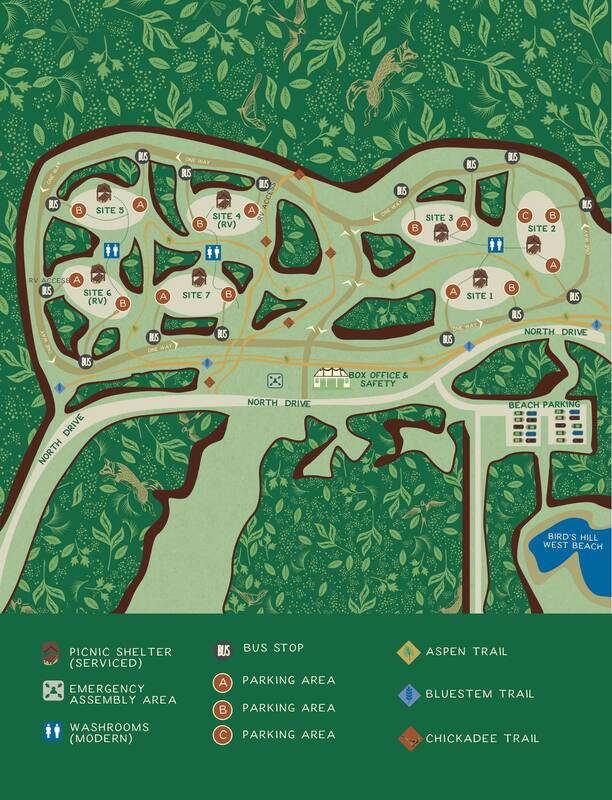 Check out this map before you get to the Festival Campground. What amenities are available in the Quiet Campground? Check out this map before you get to the Quiet Campground. Overnight parking is available for campers only and only in the campground parking lot. Do I need a park pass to enter Birds Hill Provincial Park? Yes, you will need to purchase a provincial park pass. Passes go on sale in the spring at various retail outlets in Winnipeg. Passes are also available at the Birds Hill Provincial Park gate, however they only accept cash (no debit). What time can I enter the park on Wednesday morning? The West Gate, accessible from Hwy 59, opens at 7:00 AM on Wednesday. The Festival Campground and Quiet Campground box offices open at 8:00 AM on Wednesday morning. Can I line up on Hwy 59 before the gate opens on Wednesday? No, sorry. It is very dangerous to be parked only a few feet away from highway traffic. Your safety and well-being throughout Folk Fest is a priority for us and this includes when you are on your way in. Please cooperate with us and the RCMP on this one and plan to arrive when we are ready to welcome you at 7:00 AM. That’s when the gate opens, no earlier. Why can’t you let us line up inside the park? We do – starting at 7:00 AM. It will take anywhere from four to six hours to get everyone parked and through our box office from that point on a Wednesday morning. That’s plenty of time for cars to be in a lineup! How will the RCMP enforce it? We, along with the RCMP and Birds Hill Provincial Park are asking for everyone’s cooperation with this. We hope that you all understand that we have everyone’s best interest at heart in managing the arrival of thousands of campers this way. Can I line up on Hwy 206? No. There will be “No Stopping” signs along Hwy 206, as well. The East Gate does not open until after 10:30 AM, once the lineup of vehicles from the West Gate is off Festival Drive. If you are arriving Wednesday morning, use the West Gate. Festival East Parking seems so far away. Why would I want to park there? It's no further away than previous years! Once you park, take the pedestrian-only corridor along the south side of the lot (near the trees, next to the fire lane) that extends all the way to the Festival Gate. The main advantage of parking in Festival East Parking is a quicker departure at the end of the day as you won’t have to stop for patrons using our crosswalk headed to the Festival Campground and you’ll be on PR206 in short order. Festival West Parking is so much closer. Why wouldn’t I want to park there? It is closer, that much is true. However, at the end of the night the line of traffic from this lot headed west along Festival Drive will have to stop at a crosswalk regularly to allow other festival patrons (up to 6,000 of them) to cross the road and head home to the Festival Campground. Also the speed limit (which is enforced) is 60kph through the park, which slows down the traffic flow headed that way. I want to drop off someone at the Festival Gate because _______. How do I do that? 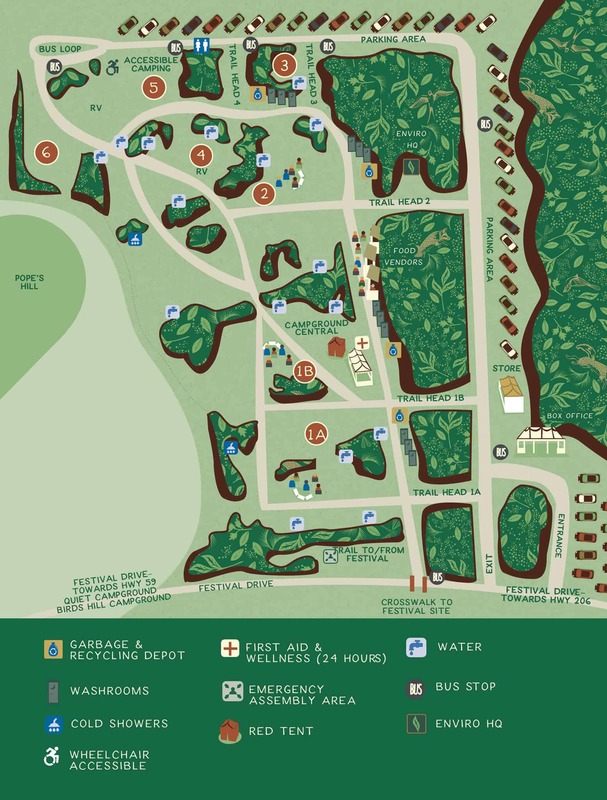 If you need to drop off a person with mobility issues, or because you aren’t parking and staying yourself, etc., then please enter Birds Hill Park by the West Gate. When you enter Festival West Parking, drive down the road you entered on until you get almost to the end and turn right down the second last parking lane. Continue all the way down to the end of the parking area. There is no designated drop off area (we’re working on this for the future), but this lane is as close to the Festival Gate as you can get. While it is possible to get to this area from the East Gate/PR206 it is significantly easier if you enter Birds Hill Park from the West Gate/PTH 59. I camp at the Provincial Campground/Quiet Campground and drive each day to and from the Festival. Where do I park? As you come in from the west, please park in Festival West Parking. When you leave at the end of the night you’ll “go with the flow” of traffic smoothly when leaving the festival and end up in the right place. An even better idea is to take the Festival Shuttle, our free bus service that runs regularly between these campgrounds and the festival site. Let us chauffer you! How long should I expect it to take to leave either parking lot? Leaving any major event with close to 16,000 attendees takes time, especially when most arrive by personal vehicle. We can’t judge how long it will take you to get to your vehicle (people walk different speeds, park in different places), but once you pull out of your parking spot we plan to have you out and on your way in less than an hour, similar to any major event in the city. What’s the system for getting cars from the parking lanes out of the parking lots? The traffic crews will be releasing vehicles, in groups of 15, from each lane in rotation. This allows traffic to flow smoothly and not jam up because of excessive merging attempts. Because of this rotation there will be times when your lane isn’t moving and others are, but know we are doing the lanes in rotation and it’ll be your turn again very soon. Moving from lane to lane will not get you out any quicker. Do you have charging stations for electric cars? Unfortunately, we do not currently offer electric car charging stations in our parking lots. Click here for the Folk Fest Express schedule (scroll down). How long does the bus ride take? It takes approximately 45 minutes to get to the Folk Fest site. Are strollers, wagons and bags allowed on the bus? Yes! They can be left in the bus aisles, as long as they are secure. Sorry, but bicycles are not allowed on buses. And, unfortunately, exterior bike racks are not approved for use by buses on the highway. Does the free shuttle offer apply to Handi-Transit users? Sorry, Handi-Transit service does not operate beyond city limits; however, all the buses on the Folk Fest Express service are accessible thanks to Winnipeg Transit. When does that last bus leave at the end of the night? I don’t want to miss any of the Main Stage performance. The last bus departs Birds Hill Provincial Park after the Main Stage ends; however, if you need to connect to another bus downtown, check Winnipeg Transit schedules because you may need to leave on an earlier departure. To get home at the end of the day, catch the bus at the stop on Festival Drive, across the street from the west parking lot. Use the crosswalk to access the bus stop. Head on over to our Getting There page for a list of all stops and a route map. What's the Main Stage tarp shuffle all about? The tarp shuffle has become a Folk Fest tradition for those who want to place their tarp close to Main Stage for a great view of the performances. To participate, get a numbered ticket at the Main Gate box office at 4:30 PM on Thursday and 8:30 AM on Friday, Saturday and Sunday. Meet at the Main Stage approximately 20 minutes after the Main Gate opens (or 5:30 PM if the ground is wet) and when your number is called, shuffle - not run - and claim your tarp space. Can I check my bag? Yes. Visit the Audience Services tent in the Festival Village to check your bag. Volunteering with the Winnipeg Folk Fest is a rewarding experience and a great way to support the festival! You need to fill out an application form here. Winnipeg Folk Festival is a showcase for first-class sponsorship experiences. The Festival offers unique opportunities for sponsors to create and deliver and customized marketing activities. Click here to get in touch with our sponsorship department. How can I perform at Folk Fest? Every year we program more than 70 artists from around the world – approximately 40% Canadian (with 8-10 from Manitoba), 40% from the US, with the rest from outside North America. Applications are currently closed - please check back in the fall for more information on how to perform at the festival. We love great food and are proud to offer festival-goers a delicious variety of ethical and sustainable food choices. Approximately 25 vendors are selected each year. Vendor applications go online a few months before the festival. Visit our Get Involved page for more information. How do I sell my art in the Hand-Made Village? Applications for the Hand-Made Village vendor spots go online in the fall. Visit our Get Involved page for more information. How do I participate in the Prairie Outdoor Exhibition? The Prairie Outdoor Exhibition is a sprawling outdoor gallery in Birds Hill Provincial Park held during Folk Fest. Visit our Get Involved page for more information. Is there a height restriction on chairs at the festival? Yes. Please bring chairs that are no higher than two feet so you don't block the view of your fellow folkies. Many folks bring home-made decorated sticks to stake in the ground so they can find their tarp easier at Main Stage. They're welcome in the seating area, so long as they you keep size in mind when you're making them. You wouldn't want to block the view of the people sitting behind you! The music is so good! Where can I dance? The Main Stage dancing areas are behind the sound booth at centre field and to the far right when facing the stage. For the last band’s set on Main Stage, people may stand up and move to the front of the stage. Please respect people’s space and be mindful of their belongings and tarps. You can dance to the right of any daytime stage. Big Blue @ Night is dancing zone - no tarps, please! Help! I lost an item at the festival. What should I do? No. Only service animals are allowed on the site and in the Festival and Quiet Campgrounds. 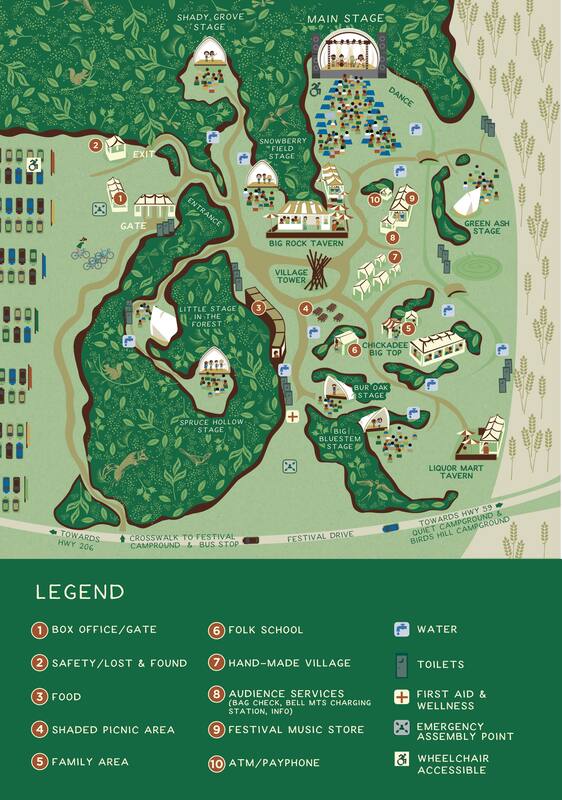 Where can I find a festival map? Right here! And also in the program book or in our app.